Professional triathlete Blake Smiley has searched the country for the perfect place to put down roots - roots he's never before had - finally settling on a beautiful house overlooking the water in Thunder Point, Oregon. He's looking forward to the training opportunities the location affords as well as the serenity of the small town where he can focus without distractions. Thunder Point seems like the perfect place to wind down his competitive career as he begins the transition to running his foundation full-time. What he doesn't anticipate is a family of retired Olympic athletes next door, a young boy who steals his heart and an undeniable attraction to the boy's mother. Fourteen-year-old Charlie Simmons aches to break free of his mom's restrictions. Once a sickly baby with life-threatening asthma, Charlie's illness is controlled by medication though he still has to be watchful. His mom insists he spend his days quietly, sitting on the steps with his computer, but Charlie longs to run, swim and bike like other teens. Lin Su Simmons is a home health nurse working for Winnie Banks. Winnie and Charlie have become thick as thieves and Charlie has spent his summer days at the Banks home overlooking the water in Thunder Point, at Winnie's insistence. When Blake Smiley moves into the house next door with his million-dollar bike, Charlie seizes the opportunity to meet the athlete, hoping that he might share some of his training knowledge. Charlie does not intend to spend his days watching life pass him by, no matter what his mom says. Lin Su Simmons has a complicated history, one she refuses to discuss, even with her son. She's a proud woman who holds herself apart from others. She put herself through school, works hard, and is a dedicated single mother. Perhaps, too dedicated. Charlie is her whole life and, in her opinion, there's no need to add anyone else to the mix, especially the good-looking athlete next door who is filling Charlie's head with dangerous ideas about riding bikes and working out. It doesn't matter that Blake finds her attractive or that she feels the same or that others think they are perfect for one another. Lin Su's heart is surrounded by solid steel and breaking through that barrier is going to be the toughest challenge Blake has ever faced. Speaking of tough challenges, reviewing Wildest Dreams was one for me. Let's start with the positives. I'm a fan of Carr's Thunder Point books. I enjoy the community aspect of the series and the opportunity to catch up with current residents while also meeting new ones in each book. That holds true for Wildest Dreams. I adored both Blake and Charlie. Blake is a self-made man who came from abject poverty. He's caring, compassionate and gives so much of himself to help disadvantaged young people. Charlie squeezed my heart on a regular basis with his desire to live life and not be relegated to the sidelines. I enjoyed their interactions and looked forward to each time they graced the pages. Winnie Banks, a prominent character in this book, continues to deal with the effects of her declining health due to ALS and Carr's handling of this storyline is both poignant and empowering. Winnie's scenes with Charlie as well as those with her daughter's former coach, Mikhail are among my favorites. What I did not enjoy was Lin Su. I understand that she's had a difficult life and I appreciate her concern for her child but I found her to be controlling, judgmental, and inflexible, not just with Blake and Charlie but with everyone. I had a hard time buying into Blake and Lin Su's HEA and found myself feeling sorry for Blake that she was the person his heart had chosen. If not for Charlie, I would have told him to run as far and as fast as he could. It's a testament to Carr's writing that I still enjoyed this book, even with my intense dislike of the heroine. Also, just because I didn't like Lin Su and didn't buy into her romantic chemistry with Blake doesn't mean others will feel the same. I'm sure there are many readers out there who do not share my opinion. So far my favorite Thunder Point book has been One Wish. I have been catching up this past week. I hope that I enjoy the book even though you could not recommend the heroine. I hope you enjoy it too, Pamela. Even though I didn't enjoy the romance, I still enjoyed the rest of the story and Carr's writing. My reaction was much like yours, PJ. 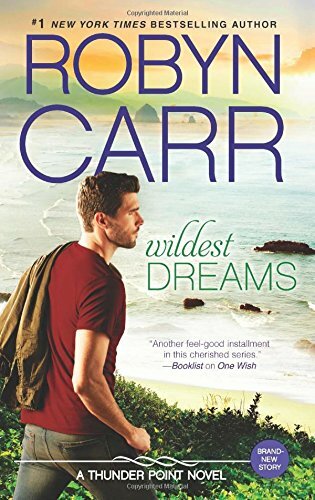 Fortunately, Carr is so good at creating community and family that one character who fails to capture the reader's sympathy does not spoil the book. All those babies being born made me smile too. I loved the abundance of babies too, Janga. The community and Carr's wonderful writing kept the book from being a fail for me. Of the 30+ Robyn Carr books I've read this is the first time I've had such an intense dislike of a main character. That's a ratio I can live with when you consider the many wonderful Carr characters who have captured my heart. Good point! Also, I listen to this series partly to get news of the previous couples, so I am looking forward to hearing about those babies. There's a bundle of them, Bridget! I felt that Lin Su was a stereotype of Asian moms and it really bothered me.